Making it difficult to report crimes is a great way to keep Chicago's impossibly low crime rates heading in a downward direction. Just when we thought we'd heard every hoop and hurdle that can be thrown in a citizen's way as they try to file a report, we caught wind of a doozy. 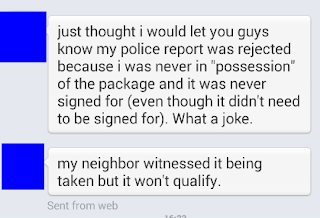 Twitter DM from the man whose package was "not" stolen. According to not one, but two area residents who contacted us independently, the Chicago Police Department has refused to accept reports of package thefts from local doorsteps because—here it comes—the packages were never in the victims' physical possession. In one case, a neighbor saw the theft take place. But that wasn't good enough for the Chicago Police Department, which refused to accept the man's report. I had video of the event and a good description of the thief. I filled out the online form with no issues, but a week later it came back as not being a valid online submission because the theft took place outside of the residence. Porches don’t count. I had to resubmit through whatever number they gave, which of course I did not. Who would call at that point? Why bother waiting on hold and telling the story again? When police manpower is slashed nearly 30%, citizens are required to file many types of crime reports over the phone—if they can endure the sometimes-lengthy hold times. Citizen directed to file police reports online recently found the task to be impossible. As we were first to report, the police department's website was rejecting every submission because it didn't recognize any address—even Chicago police headquarters—as being within the city limits. The department fixed the issue after mainstream media inquiries were made. Another favorite "crime-cutting" technique is downgrading serious crimes such as burglary and robbery to lesser categories such as "theft from building" and "theft from person." Last year, police infamously categorized a reader's phone theft as non-criminal "lost and found." And a man in Wrigleyville who found himself surrounded by five offenders who then took his keys, wallet, and other valuables from his pants was not robbed. He was "pick pocketed." In February, we found that the city was failing to include all crimes in it's highly-touted data portal, a web site that is used by major media outlets to generate statistics for their reporting. Among the cases that was not listed? The robbery of Rahm Emanuel's own son. 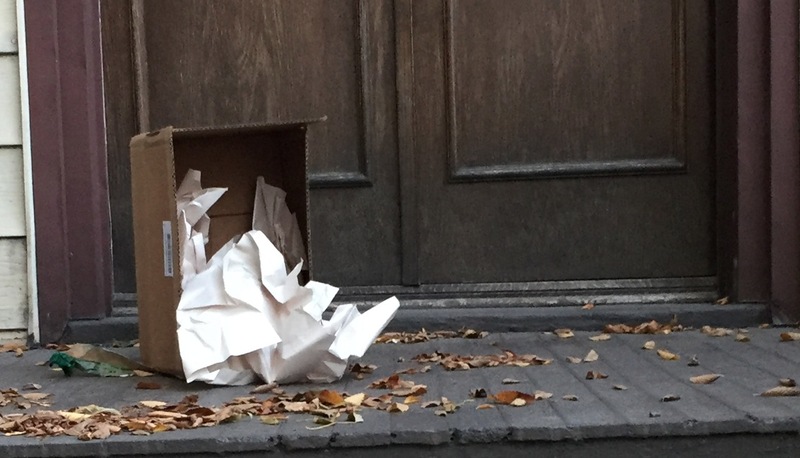 Image: Reader photo of a package that had been emptied of its contents on Southport Avenue last week.